Last night at the scrutiny meeting (see page 65), an official explained that H&F Council’s budget for training is £1.1million. But, here's the thing: a third of people booked onto the courses don’t turn up. I asked about this waste. It was pointed out that the £1.1million cost could be doubled to £2.2million if you add in the associated charges of getting extra cover and lost work. That would mean that our council is throwing away £726,000 of Hammersmith and Fulham tax payers’ money on people who don’t turn up to training courses - a sum getting on for almost 1.5% of council tax. It turns out that there’s been virtually no objective assessment of why that happens; there’s little to no pre and post training course work to ensure the training will deliver productivity benefits and there has been a widespread culture of acceptance at all levels of the organisation that this frivolous approach is a professional way to behave. Cllr. Rory Vaughan (Lab) asked if departments are charged for none attendance – as happens in many well run organisations. The officials looked uncomfortable by this question and said “we looked at this and decided not to do it… It all comes out of the same pot anyway” - indicating that this had probably been discussed and scuppered by the borough’s senior management and almost certainly for all the wrong reasons. Consider the Council's £186million total budget; H&F Conservative’s failure in invest in extra police; the £547 increase in meals on wheels charges to save £150,000; or any of the other cuts in key public services and stealth taxes then it puts their £726,000 waste in this area into a different perspective. 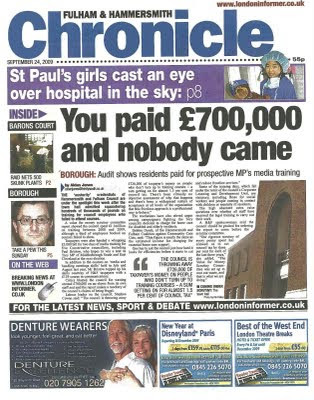 UPDATE: The Fulham and Hammersmith Chronicle have also featured this story in this week's edition. Click on the photo (opposite) to read Aidan Jones' exposé. 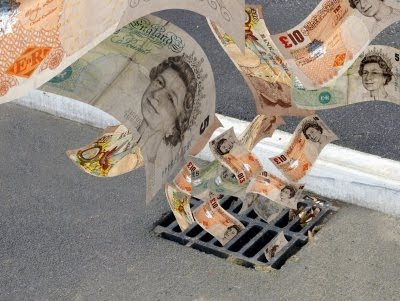 That money could of gone for new barriers andticket paying machines in the car park next to the king Shopping centre.has it keep breaking when i go there. Nearly the same as the estimated income from charging disabled and older people for essential support. Charging is unethical, join HAFCAC and fight community care cuts. What a waste! Pathetic really.